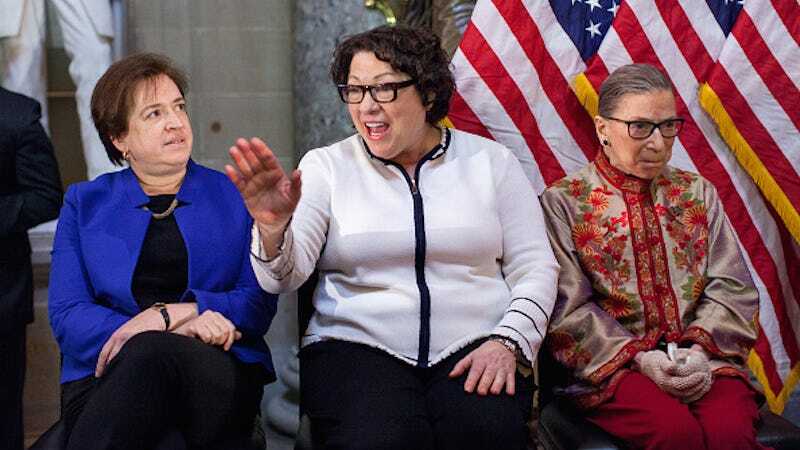 Today in About Damn Time: the Smithsonian’s National Portrait Gallery uncloaked a portrait featuring the women of the United States Supreme Court, past and present. As of November 2, 2015, the painting hangs in the Washington, D.C. gallery. The portrait, which you can see here, includes current justices Ruth Bader Ginsburg—pour one out for the Notorious RBG—Sonia Sotomayor, and Elena Kagan, as well as Sandra Day O’Connor. Retired in 2005, O’Connor “became the first woman ever named to the Supreme Court” in 1981. Ideally these conversations are already happening around the country. But perhaps this portrait will serve as a reminder that all women—that all marginalized people—are capable of the remarkable and the momentous. Correction: This portrait was actually unveiled two years ago, in the fall of 2013. So let’s celebrate its two year anniversary by visiting the National Portrait Gallery and throwing SCOTUS-themed shindigs.